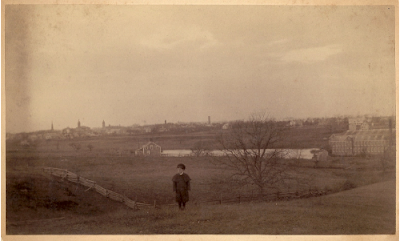 This dramatic view of a solitary boy on Indian Hill taken at the turn of the last century well illustrates the coexistence of agriculture and industry at the time in Middleborough. In the distance, across the Nemasket River, the village of Middleboro Four Corners is visible with the steeples of the Central Congregational Church, Middleborough Town Hall, Central Baptist Church and Central Methodist Church, and the Forest Street standpipe interrupting the horizon. Fields, including those sloping down to the river from North Main Street, surround the town and give it a compact yet rural feel. The bright surface of the Star Mill pond is readily visible, as is the Star Mill itself, the large brick building at the far right, which was then operated by the Nemasket Worsted Company. In the center distance is a small house once owned by the Star Mill and after 1928 by the Maddigan family which later farmed the property.